Yesterday's launch of new Housing Board flats got off to a slow start, though experts predict a slew of applications by the time the sales exercise ends next Monday. There were 3,770 Build-to-Order (BTO) flats on offer, with those in Ang Mo Kio and Bedok expected to draw the most interest. "There will always be strong demand in mature estates as land is limited," said PropNex Realty chief executive Mohamed Ismail Gafoor, who expects four or five applicants for each unit in those estates. R'ST Research director Ong Kah Seng expects more than six applicants for each Ang Mo Kio flat, and at least eight for each in Bedok. As of 5pm yesterday, there were 99 applicants for the 947 flats in those two towns, or about one applicant for every 10 available flats. Also on offer are 5,170 balance flats in 14 mature and 11 non-mature towns. These include 13 executive flats - a type of flat that the HDB no longer builds - as well as a unit at The Pinnacle@Duxton going for $746,000 before grants. Among them was first-time buyer Patrick Wong, 33, who wants a flat in Bedok because of its convenient transport links. "It is really very expensive, but no choice. I'll have to work hard and apply for loans," said the self-employed man. For BTO flats in the non-mature estates of Bukit Panjang and Sembawang, there were also 99 applicants as of 5pm yesterday - but these were for 2,823 units. Still, experts think that overall demand will be healthy, not least because Bukit Panjang is now served by the Downtown Line. "That has made Bukit Panjang a more convenient place to live in and applicants are likely to take this into consideration," said ERA Realty key executive officer Eugene Lim. Mr Ismail expects two applicants per unit in the non-mature towns, while Mr Ong expects at least three applicants per unit. Ms Isabella Leong, 33, who works in the food and beverage industry, is applying for a four-room flat in Bukit Panjang as it is close to where her parents live. "I don't think there will be a problem applying in terms of competition." It was announced that BTO flats would be offered in Bukit Merah during this exercise. But the project "is undergoing further review, to better integrate (it) with the surrounding developments", said the HDB. It will be launched after the review ends. This launch also marks the start of greater priority for second-timer families in public rental flats. 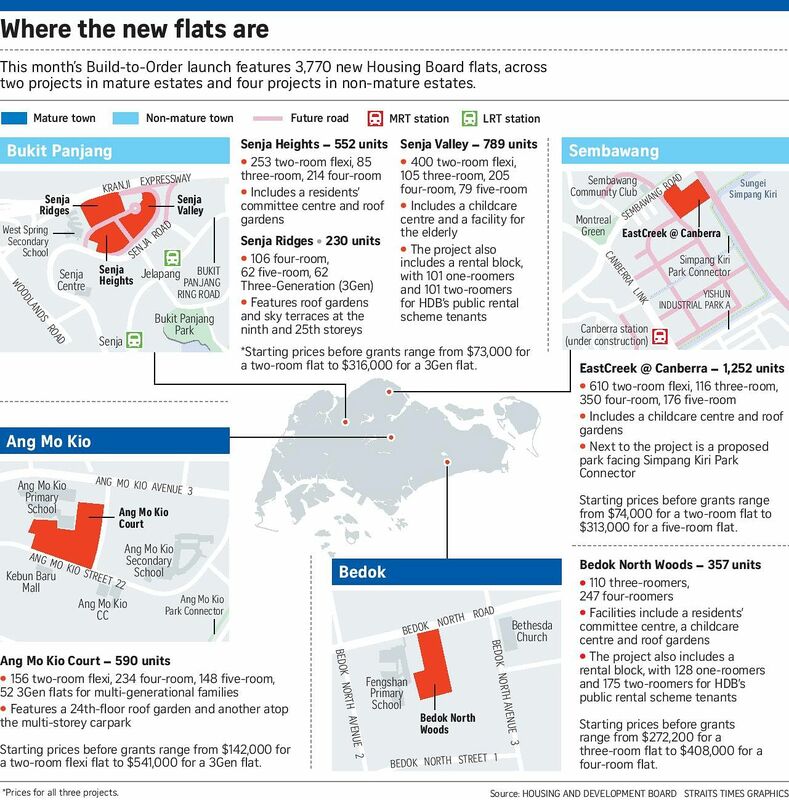 At the next BTO launch in August, about 4,810 flats will be offered in Hougang, Sembawang, Yishun and Tampines.